Our residents receive an early Christmas present! Having previously donated two rugs in 2015 and a further four rugs in 2016, super supporter Debbie Joseph has once again blown us away with her generosity, donating six brand new rugs to Redwings, meaning some lucky ponies and donkeys will be kept extra cosy this Christmas. Frodo, Rav and Rory Best are three of the ponies and donkeys to receive a rug this Christmas and don’t they look great?! 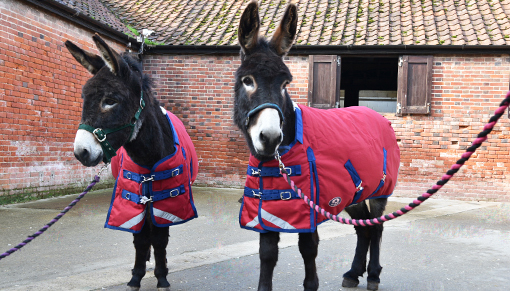 Like all donkeys, Ryan and Rory Best (above) have complex care needs, especially in the winter when they are particularly sensitive to the colder temperatures, so Debbie’s generous donation will go a long way in helping keep our long-eared residents keep warm this winter. 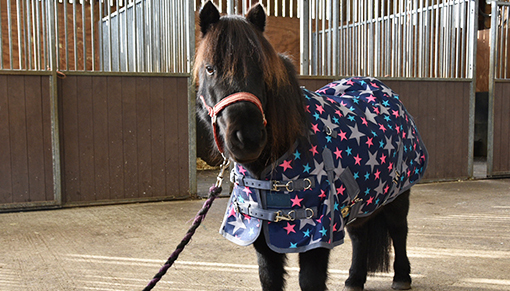 Shetland pony Frodo has been enjoying his brand new rug too, which has been keeping him cosy while he looks for a new home as a companion pony this winter through the Redwings Guardianship Scheme. It’s thanks to #RedwingsAngels like Debbie who help us do the work we do. If you would like to donate an item to help us care for our horses or for us to sell to raise funds for our residents, email our Gifts in Kind Manager Anne on agalloway@redwings.co.uk. Do you need advice about rugging and winter horse care? Knowing whether or not your horse needs a rug is really important so click here for more information.